Welcome To Your Senses: The Nelson Manickam Road of London. The Nelson Manickam Road of London. "Porambokku ! Bemani ! Orama poda !! Vootla sollittu vandhhuttiya ?" "Ayye !! Moodhevi ! Signal vuzhundha naan yen Runwayla ninnuttu irukken.."
Click picture for the bigger version. You've gotta see this BIG. So Click and view it full, first. I was doing this on Saturday night. Going places on Google Earth. Airports are always a fantacy, for me. 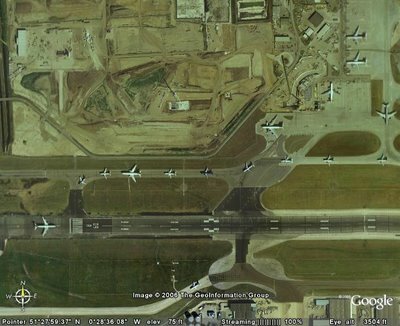 I have visited almost all the big and interesting airports on this earth, of course through Google Earth. And this view of Heathrow Airport, London was Whaaw !! With all the cheap airways rushing into the Indian skies, We could find a similar surge of Air traffic soon on the domestic airports of India. Thanks, Air Deccan. What change Reliance did to the algorithm of the mobile market, Air Deccan has done it on the Air Travels.